thought we dusted ummmm...now when was that? when was it…let’s see…mom and dad were here two weekends ago…. OH yeah…guess that is why there is dust! Did anyone see the play the first baseman of Carolina made on the first pitch of the game?! Dustin Ackley ran under a foul fly ball and made an back to the play catch over his shoulder. What do we feel like for dinner…? water is on for a side of Linguini Aglio e olio (garlic, oil and parsley). Cook pasta in a large saucepan of boiling salted water until just tender; reserve ½ cup (125ml) of the cooking water. Drain pasta, return to pan. By returning it to the hot pan, you dry out the pasta and your gravy or other sauce will stick better to your pasta. Meanwhile, combine oil, garlic and red pepper flakes in a medium frying pan; heat gently, stirring, until garlic is soft and fragrant. If using them, put the anchovy filets in for the last minute or so. Toss pasta with oil mixture, parsley and salt to taste. (they are tricky with the old one) and for soft foods…that would be cool! Do you like "The Office"? Back to the story... Mr. Green signed as a free agent for the Houston Texans football team. Now Mr. Simmons wore Mr. Green's lucky number 30. Athletes have their lucky numbers (Matt has always worn number 8, except for a few All-Star teams) and when they join a new team they will sometimes offer to "buy" it from the player wearing it. Clinton Portis of the Washington Redskins paid $38,000 for his number 26. Roger Clemens gave a gold Rolex to Carlos Delgado when he joined the Blue Jays and wanted 21. Eli Manning gave kicker Jeff Feagles a family vacation for number 10 when he joined the NY Giants. When asked by Mr. Green what he wanted for the number, Mr. Simmons says "How about making a down payment on a house for a single-parent family?" Green is quoted in the article as saying, "I was like, 'Oh Man! That's awesome! Sign me up!' "
Then Mr. Green decides he will also pay the mortgage for the first year! Pretty cool huh? Instead of another Rolex or even a car or vacation, a single mother with three kids, (the preference of Mr. Green and Mr. Simmons) will have the opportunity to upgrade her family's life. Applications are pouring in from mother's and from others who know someone in need in the Houston area. Simmons is from L.A. an only child of a school teacher mother and a father on disability and is quoted as saying "Asking for a watch or a car, that was going to make me feel uncomfortable...Money can ruin you." Green's family did not live in their first house until he was a teen, so he knew about the joy of finally getting your own yard. SO guess what happens next? Then a mattress store...an electronics store...and even the electric company said they would pay for a year of service! THE OFFICE...for sure! I am addicted...love it love it love it! Can't wait for season 4!! Grape juice - white or purple? Not into baseball - sorry! Although I know your Yankees swept our D-backs (damnit!) As for CWS, my Sun Devils are eliminated, sooooooooo....who cares? Hey, genius, could come over and dust my house? Oh, wait, we don't dust...we VACUUM the dust because it accumulates so quickly! Nope, don't do "The Office" or "Scrubs." Cool story about the nets, but I think you're a week behind me on SI. Life of Reilly this week is entitled, "The Wrath of the Golf Gods." Haven't read it yet; just pulled three days of mail out of the mail box (it's too damn hot to walk down there! ), and I haven't had the chance to even flip through this week's SI. I love stories about sports figures actually acting like compassionate humans. That kind of goodwill spreads to the corporate bigwigs, and BAM! Kindness spreads. How cool is that? You know, I felt the same way about "The Office" during its first season. I could never get into it. I started watching it this year though and thinks it's absolutely brilliant. Such smart writing and great comedians on that show. I love the dry wit and simple, observational humor. 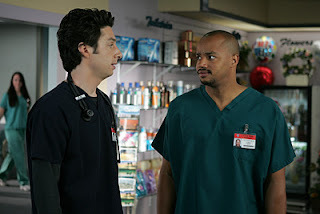 "Scrubs" usually has a few funny parts but overall I'm not a fan. Great play by play of the Carolina game. I love The Office--watched the original British version first and love it as well. And I love Scrubs--yup. That's not nearly enuff garlic, Mister!!!! Miss you - SMOOCH!!! Chocolate Meringue??? nice bond. very nice. i tried to read the rest but i was busy eating the pie and my attention wandered. i did see something about the office but i have never heard of it. should i be watching? sarge has poker on all the time and that's about all i get. i DO know big brother is back on july 7th and i an stoked about that. 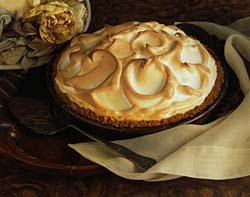 well bond, i have about finished the pie honey so i will be on my way now... thanks ever so much, it was heavenly! good grief, man, that was quite a ramble! Nope to The Office, but YES to your linguini! Have a great rambling weekend! 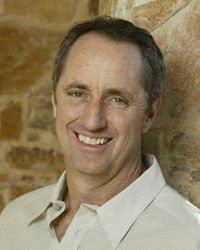 Rick Reilly is a fantastic writer, and seems to be a decent guy. Cheers Vin!! Your pasta sounds yummy. BUT only put the oil in if you are using an oil based sauce. Otherwise, the sauce won't stick to the pasta like it's 'spoded to. 8) Just a friendly tip from your local chef. And I love The Office. It's actually one of my most favorite shows. I like stupid everyday humor like that though. So it makes sense. oh I love Rick Reilly, I read the first few pages of the magazine and then skip right to the back to read what he's talking about, because its either funny, touching or both. And its something in SI I can always get the wife to read. gotta love the purple and black, no? 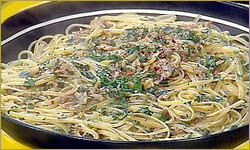 I love the linguine, its likes something i make already, but now I am gonna add anchovy paste. Umm, Bond, u taking ur meds again? Cuz the others want to come out to play obviously. What a generous idea!! I agree whole heartedly, I wish other athletes would have the presence of mind to do something like that. Dusting is just an afterthought for anyone LOL. Myself, I hate doing it - until my allergies kick in. Don't watch the Office or Scrubs. I watch too much TV as it is. Yes, I know you've been leading the cause for the nets for a long time. When I first started reading you I saw that (I gave your blog a VERY thorough reading before I started making comments.) I meant I thought it was wonderful that there was an update on the story. Love both Scrubs and The Office btw. So tell me, do you cook in those shoes you got posted one up? STARR: LOL only when I am having special guests! In fact all the food here sounds great! I just had haggis. Not joking. Rick Reilly is usually my favorite part of the magazine. I read his column, then go back and read through from front to back. Sometimes I'll even read Mr Reilly again. Great story about Green and Simmons, and the rest of the community pulling together. Have a great time with Andy this weekend. So, so much to comment on here but there are two things I can't get past. One: Scrubs and The Office are both fantastic. Drifting is unacceptable!